This exclusively designed system features a single infrared camera that captures the initial conditions of a damaged frame, allowing the operator to determine what corrective measures need to be taken. The camera, which has a self-contained light source for accuracy, connects with retro-reflective targets mounted with self-centering frame gauges that accurately represent vehicle conditions. Enter specific vehicle data and capture “before” pictures of the damaged areas to upload to diagnosis software. Properly mount the frame gauges on the truck rails. New lock design secures the gauges to the frame, ensuring that they sit 90-degrees to the frame. Focus the camera and capture coordinates of all points on all targets. The 3D system diagnoses and illustrates the condition(s). 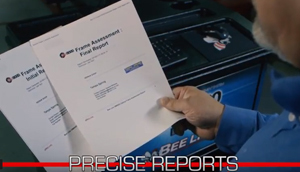 Results are documented and a report is generated showing before and after photos and frame assessment data. Check out a short overview of this NEW system.